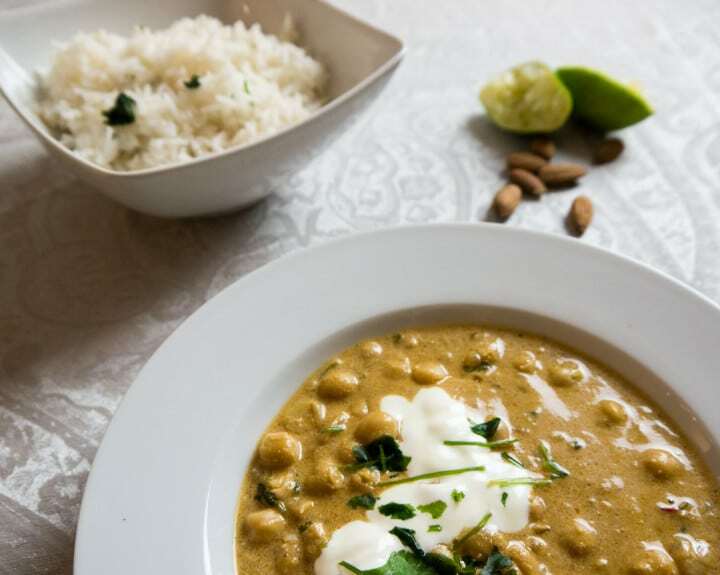 This flavorful Chickpea Curry is a staple in our kitchen. It’s so quick and easy to make. 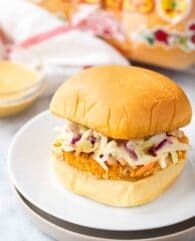 A perfect dish for Meatless Monday! We both love all sorts of curry, especially on a cold day, it’s nice to eat something spicy. 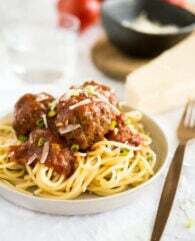 Everything I use in this recipe I already had in my pantry or in the freezer which is a big plus for me because sometimes you don’t want to leave the house. 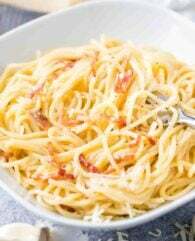 This dish is so easy to make, but the flavors are great. When you don’t have garam masala at home, which is an Indian spice mix, you can use normal curry powder but I recommend buying some if you plan to make more curries. And I think you will make more after you tasted my Chickpea Curry wit Lime Rice! Give it a try and tell me how you like it. This flavorful Chickpea Curry is a staple in our kitchen. It's so quick and easy to make. A perfect dish for Meatless Monday! Heat 1 tbsp oil in a large heavy based pot over medium-high heat. Add onion, ginger and chili. Cook for 3-4 minutes until onion is soft. Mix tomato puree, spices, coconut, almonds and fresh coriander in a little bowl. Add spice paste to your pot. Cook for 2 minutes while stirring. Be careful not to burn spice paste. Add chickpeas and mix until covered with spice paste. Add coconut milk, stir and let it simmer for 8-10 minutes at low temperature until the rice is ready. Put the cooked rice in a bowl and mix with lime juice and coriander. Adjust the seasoning of the Cickpea Curry with salt and pepper. Remove from heat and serve topped with a spoon full of yoghurt and some coriander. This sounds amazing! I could eat curry all the time! Lovely combination of flavors you have going on there, sounds wonderful! Thanks Amy! Love your blog! 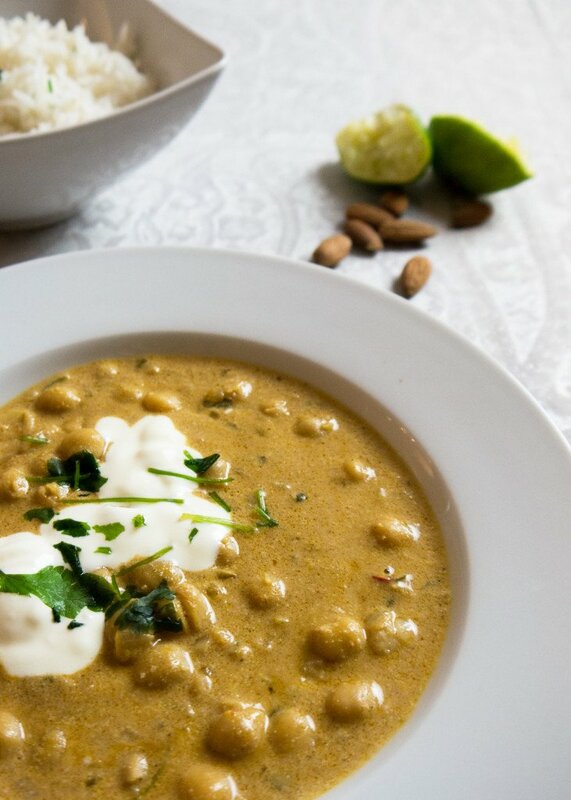 Looks so creamy and delicious – Always looking for more ways to add more legumes into my meals! Thanks Christina! We’re trying to eat more legumes, too. WoW, the curry looks gorgeous! 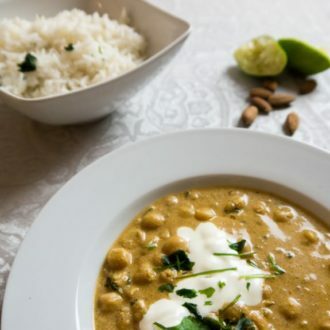 We cook Indian food on a daily basis but has never used coconut milk in chickpea curry, sounds delicious! This is such a heartwarming dish for the cold weather. Love the touch of lime in the rice. Thank you Christine! The lime in the rice gives it a really nice touch. Curry + Rice = PERFECT combination! Especially the rice being lime flavored – YUM! Gotta have it! That looks delicious, and I love that it’s so quick to prepare. A perfect warming dinner now that winter is upon us!